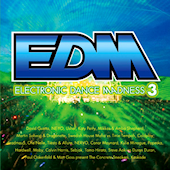 The third release in the EDM series has been delayed a week. Cover art and the final track list have been revealed, though. Expect EDM hits from David Guetta, Deadmau5, Moby, and others. Also includes a new song and remix by Tomo Hirata. Hmm, I wonder how long before we start seeing more new remixes by Japanese producers? 06. Big in Japan (Club Edit) / Martin Solveig & Dragonette feat. Idoling!! !